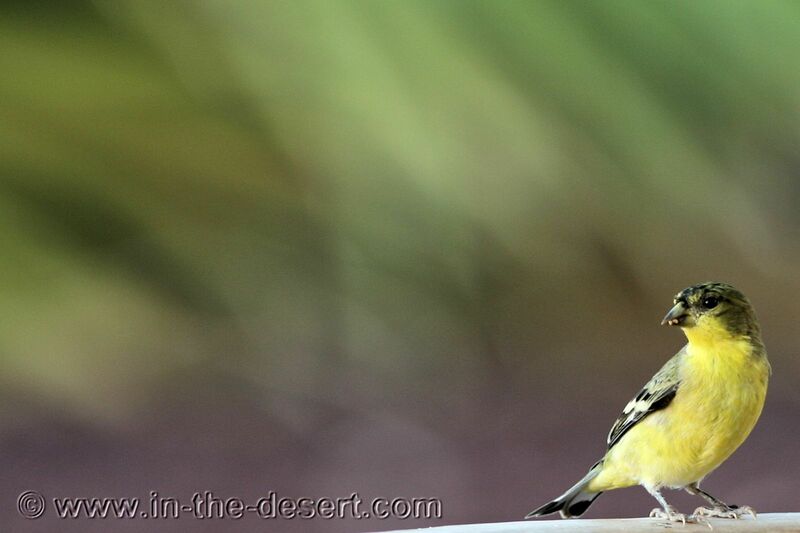 Smaller birds often seen in the desert of the southwest. 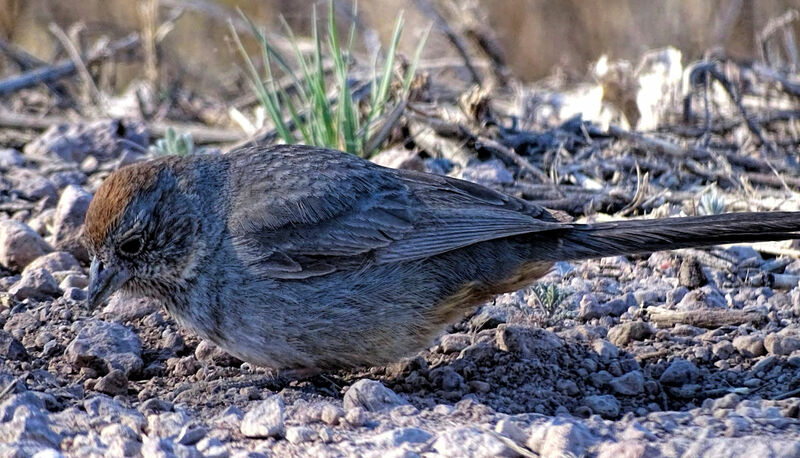 The Cactus Wren searches in the desert under leaves and other ground litter looking for a meal. This is the Arizona State Bird. Often seen on top of Saguaro cactus. 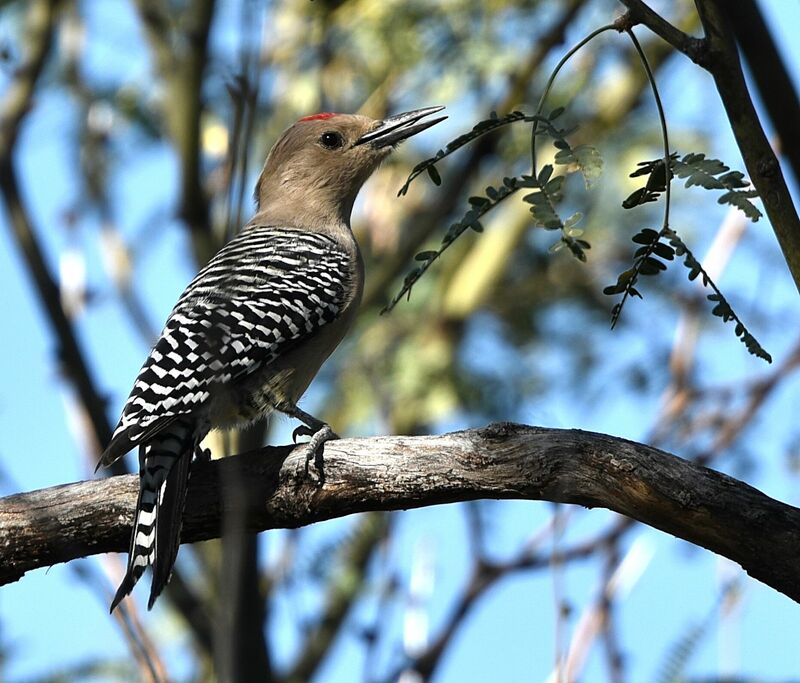 This bird was photographed near Tucson, Arizona. They nest in holes in giant Saguaro Cacti. 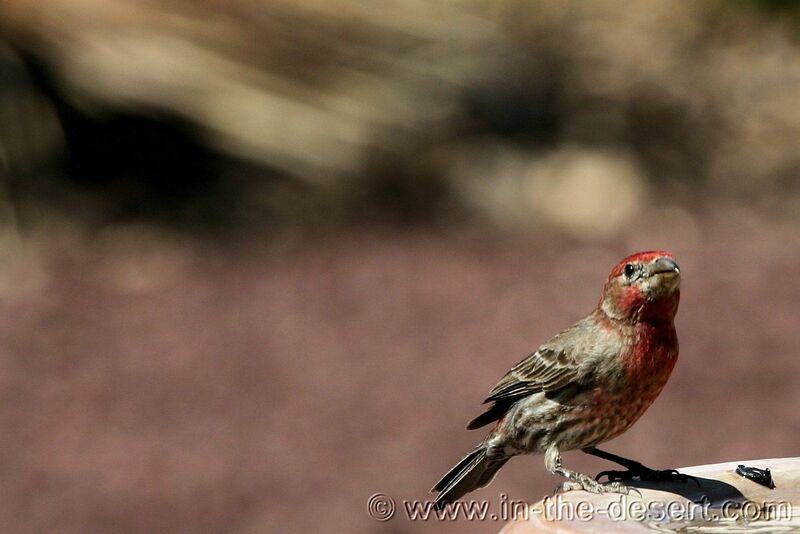 The House Finch is found in the Chaparral, desert, and orchards.They eat weed and grass seeds. This female Humming bird was nested and sitting on two eggs. 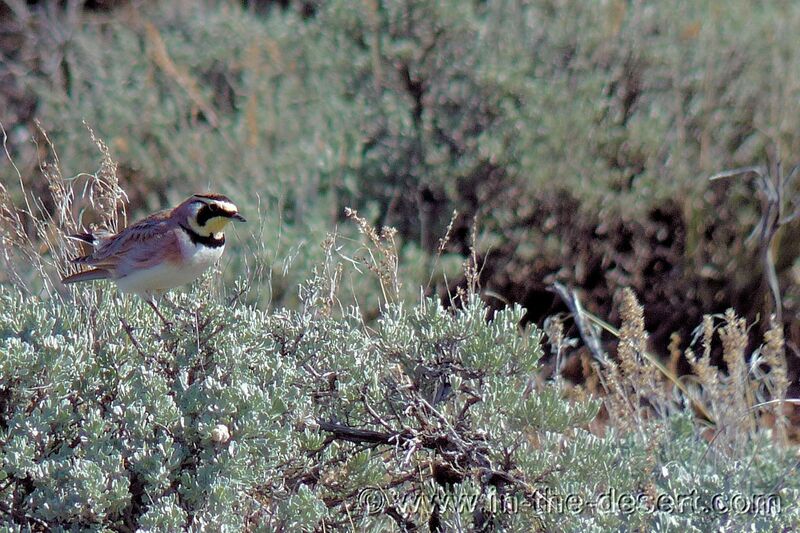 They are common in the desert Southwest. There are at least 16 species of Humming Bird. The Lesser Nighthawk fly's low looking for insects at dusk. This one was found in a wash and was very well camouflaged. Not usually seen during the day. The Gambels Quail usually travel in family groups. They also usually have 10 young which follow them around. They are attracted to water and gather in large numbers. 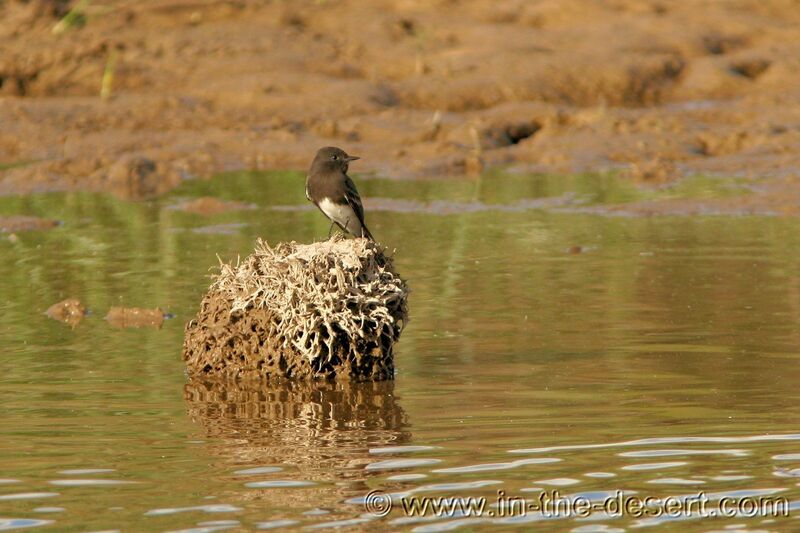 The Black Phoebe seen here looking for insects in the river. Sits upright and wags it's tail frequently. 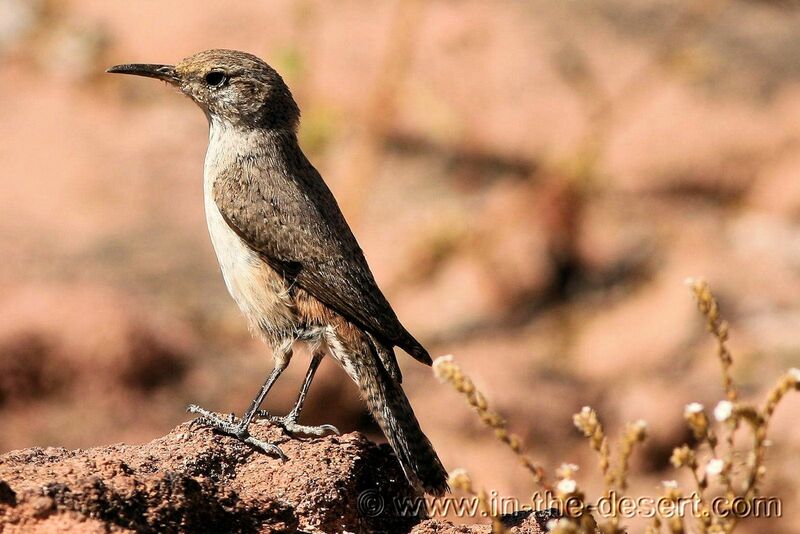 The Says Phoebe is found in the desert in many locations and is an insect eater. They are in the flycatcher family. They will eat other foods like berries when insects are not available. 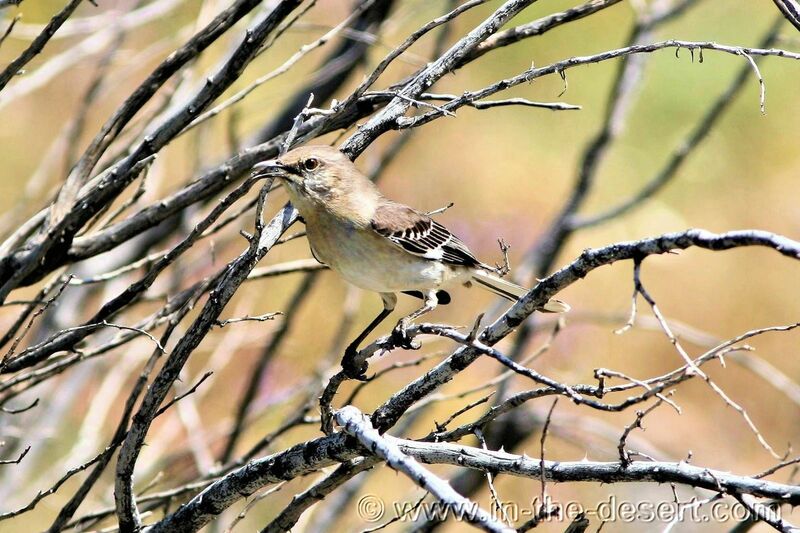 This is the Northern Shrike - and it's a bad bird! It eats other small infant birds, insects, and mice. It kills more than it can eat. 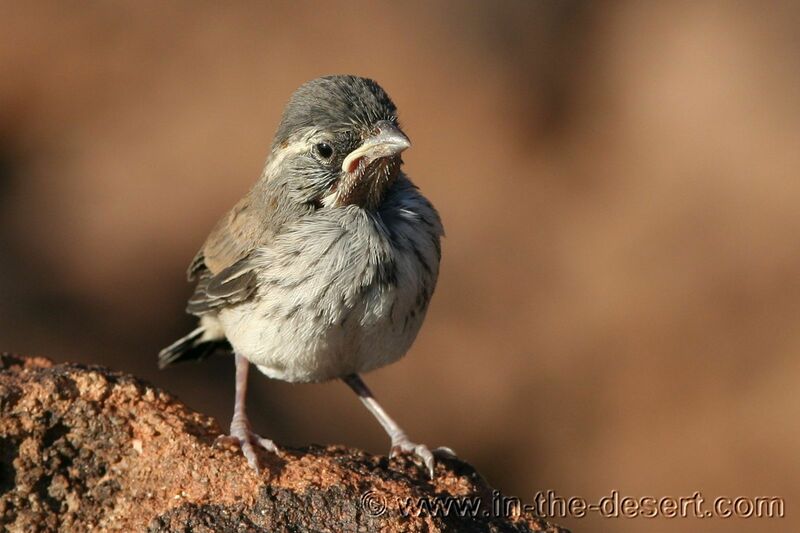 The Yellow-eyed Junco is a resident of the mountains of Southeastern Arizona and Southwestern New Mexico. 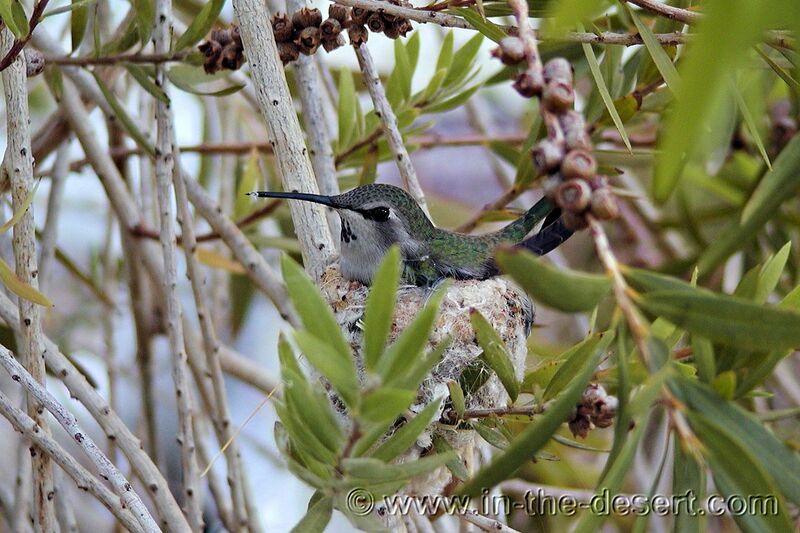 This one was nesting in a Yucca plant. The Belted Kingfisher is found near rivers, lakes and salt water estuaries. Eats fish, salamanders, lizards, mice and insects. 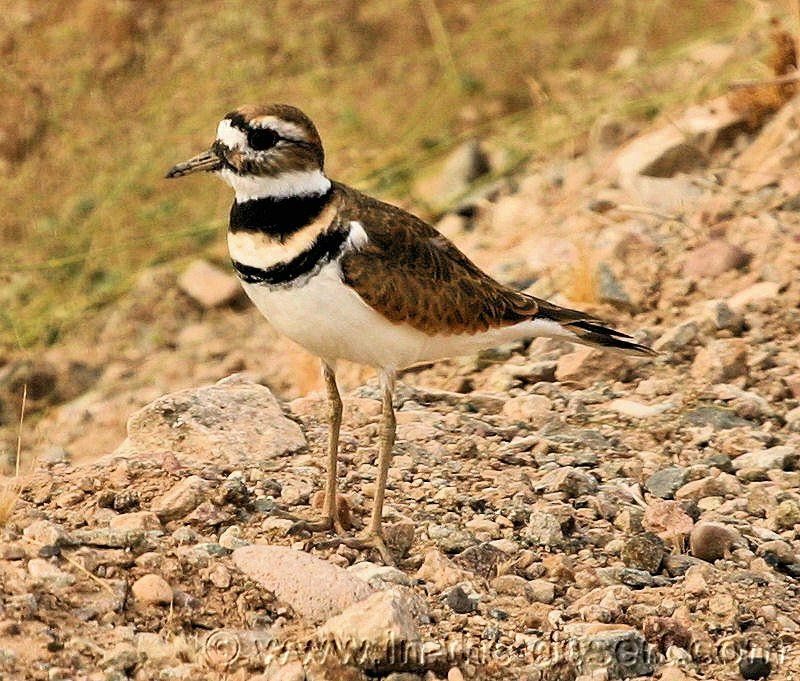 The Killdeer is a professional at faking being hurt; often limping on one foot with his one wing spread to make it look broken. They live and eat in open country and plowed fields near water. The Northern Mockingbird is a real character. He can imitate numerous other birds and when looking for a mate can continue with his calls day and night. When flying he can be indentified by the white patches under his wings and tail. The American Goldfinch (Wild Canary) travel in flocks and their main food source is weed seeds. They migrate in compact flocks. This Saguaro has a rather large bird nest. If you pay attention while in the desert you'll see nests in all types of cactus. Like the one in the Cholla Cactus below, it makes you wonder how the birds can build a nest in such places. Don't forget the binoculars and always keep your camera handy. Old dead Saguaro cacti is another great place to find nests. 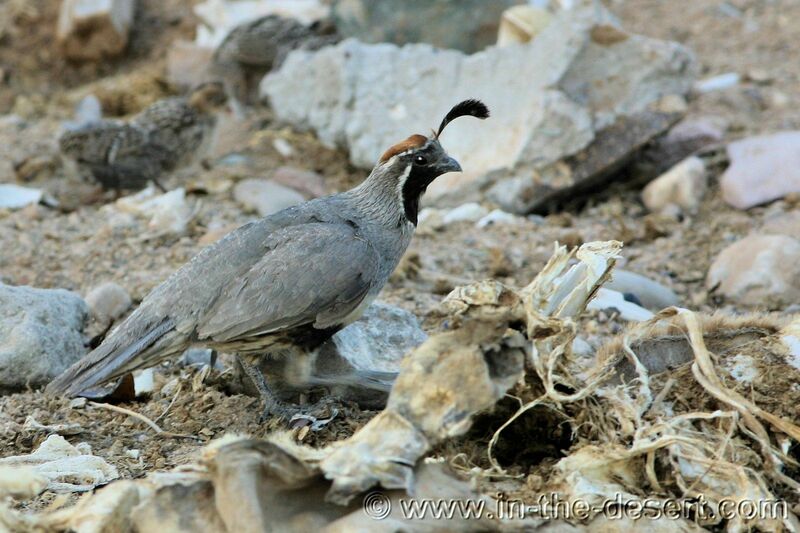 Several species of birds in the desert nest on the ground. A baby Mockingbird on his maiden flight. He landed 7 ft. away and realized he was in the presence of something much bigger than him, and started to yell. What a neat experience. These two species of Shrikes are almost indistinguishable in appearance and habit. The males have "horns" on their forecrown, small tufts of feathers visible only at close range, a black band on the breast and a black mask. Juveniles are speckled with a hint of the adult's facial markings. Eats seeds and insects. 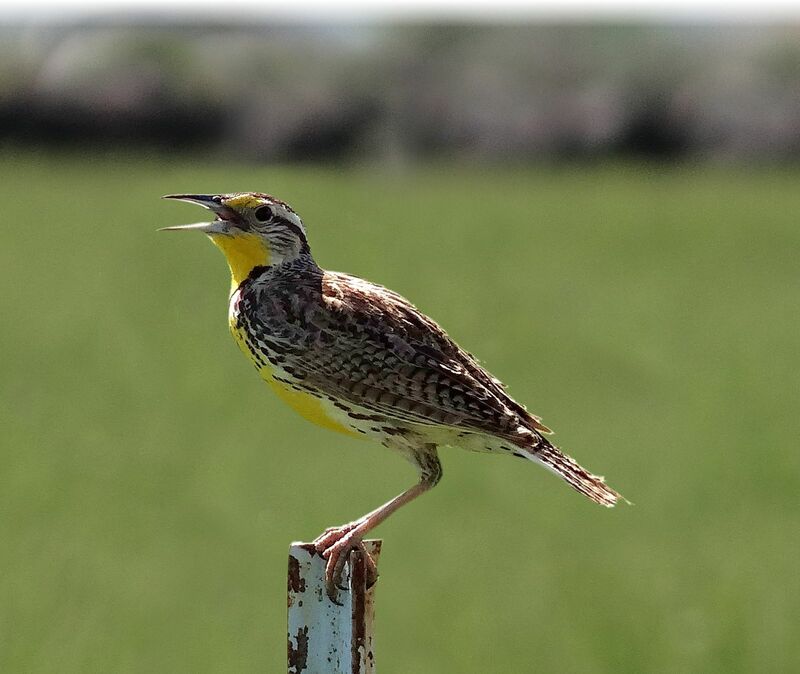 The Western Meadowlark is the size of a robin but chunkier and has a shorter tail with a flat head, long slender bill, and a round shouldered posture that nearly conceals it's neck. They seek wide open spaces in the Spring, Summer, and for winter foraging. Found in low to medium elevations (as seen here) up to an elevation of 10,000 ft. 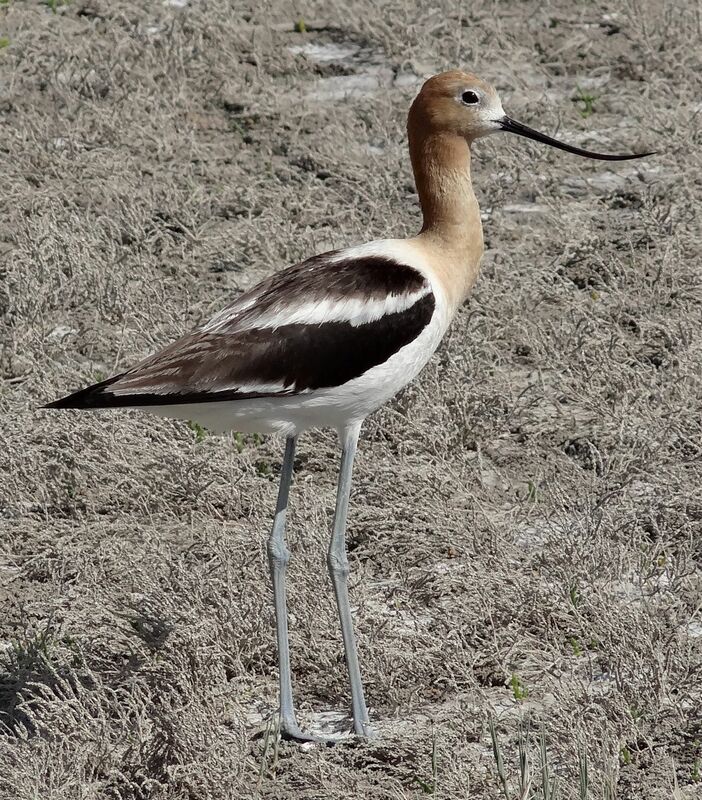 In the summer this bird can be found in temporary and unpredictable wetlands across the western part of North America. It swings it long upturned bill through the shallow water to catch small invertebrates. 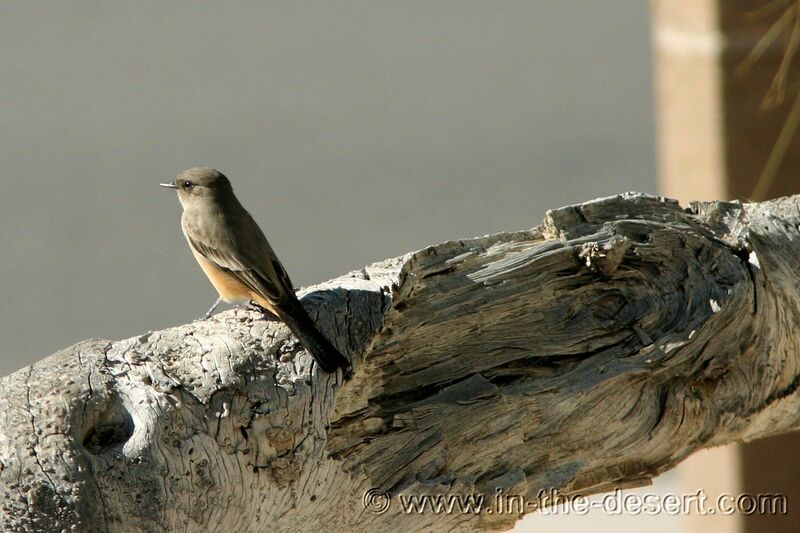 Length = 16.9 - 18.5 inches..
Plumage is pale gray-brown, fading to whitish on the belly, with cinnamon-buff undertail coverts. Roufous-brown cap with a buffy eye ring. Necklace of black streaks. Juvenile lacks rufous crown. Photo taken in Bosque del Apache National Wildlife Refuge, San Antonio, New Mexico. 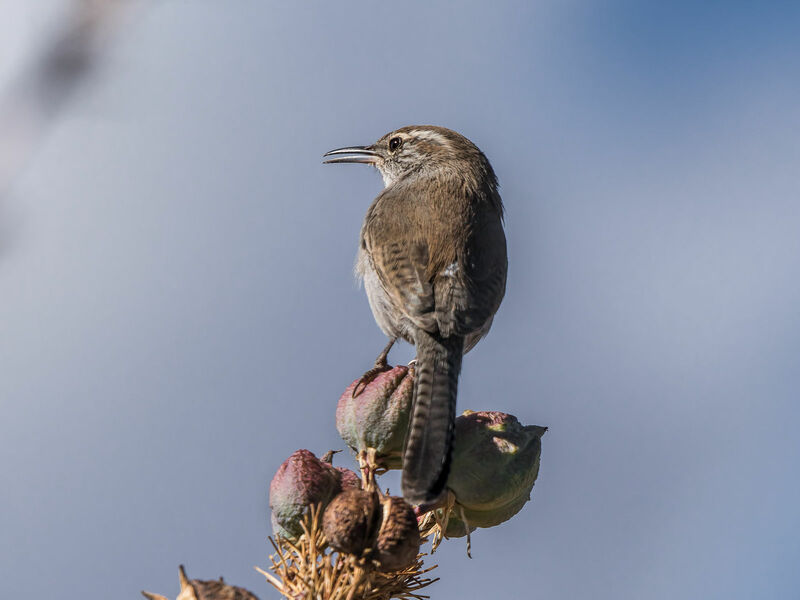 Bewick's Wrens eat the eggs, larvae, pupae, adult insects and other small invertebrates. Common prey include animals like bugs, beetles, bees, wasps, caterpillars, butterflies, moths, crickets, grasshoppers, flies, spiders and often eat seeds, fruit and other plant matter. This one was seen in St. George, Utah. 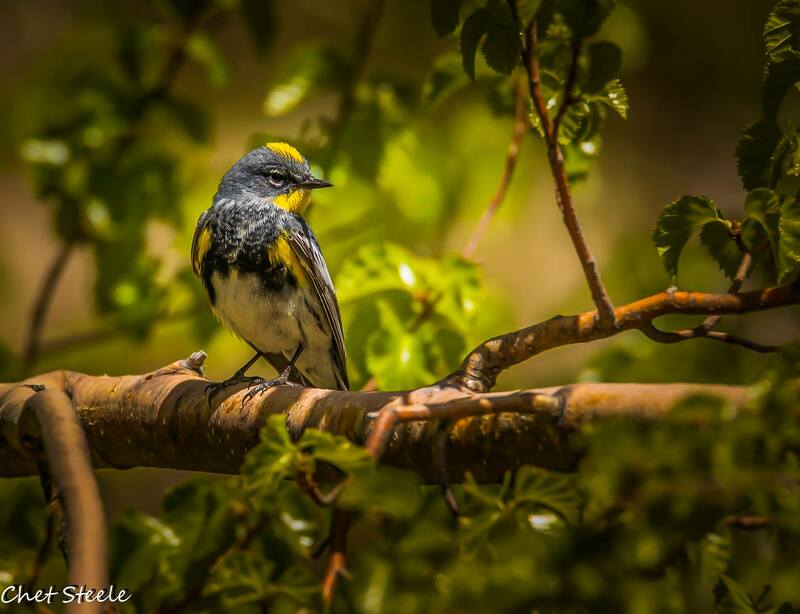 Jabbering clouds of yellow, green and black Lesser Goldfinches gather in scrubby oak and cottonwood in the western U.S. 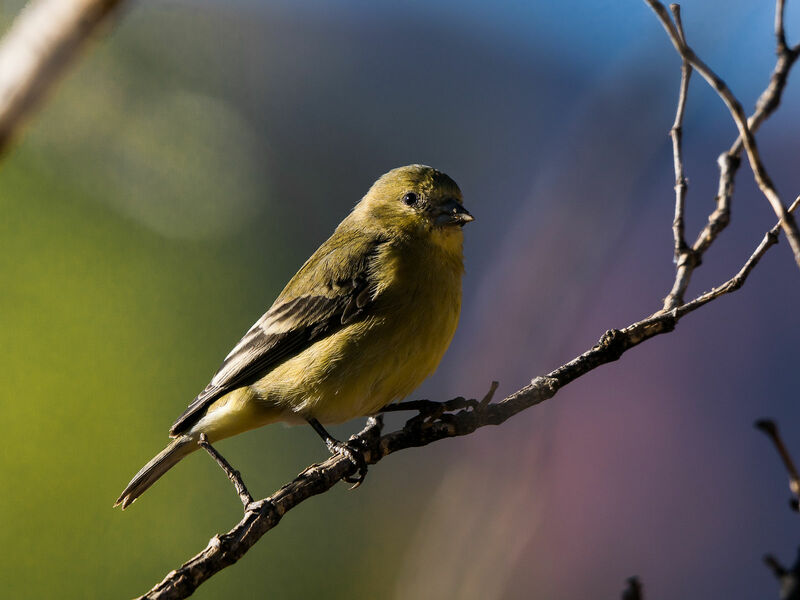 These finches primarily eat the seeds of plants in the sunflower family and occur all the way south to the Peruvian Andes. This one was found in Ivins, Utah. This stocky finch like bird is related to Cardinals and Grosbeaks and often visits birds feeders. 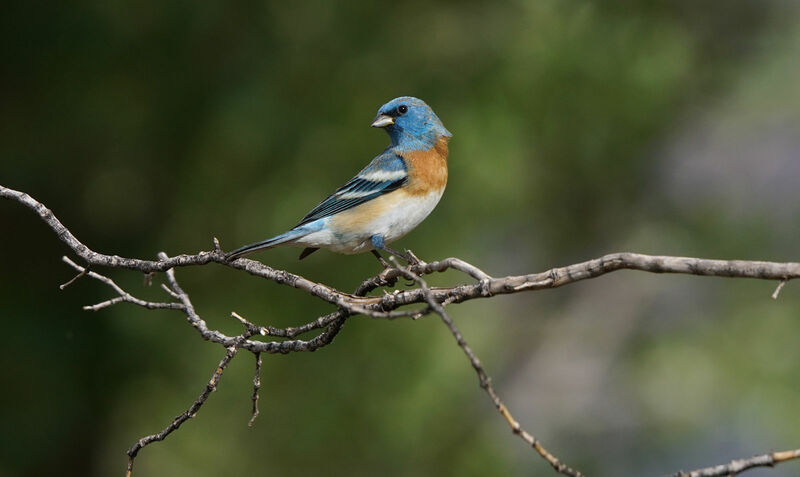 These birds visit dry bushy hillsides, thickets, and gardens throughout the West. This one was seen in Ivans, Utah. Many thanks to our viewers for helping to add to the "birds" data base! 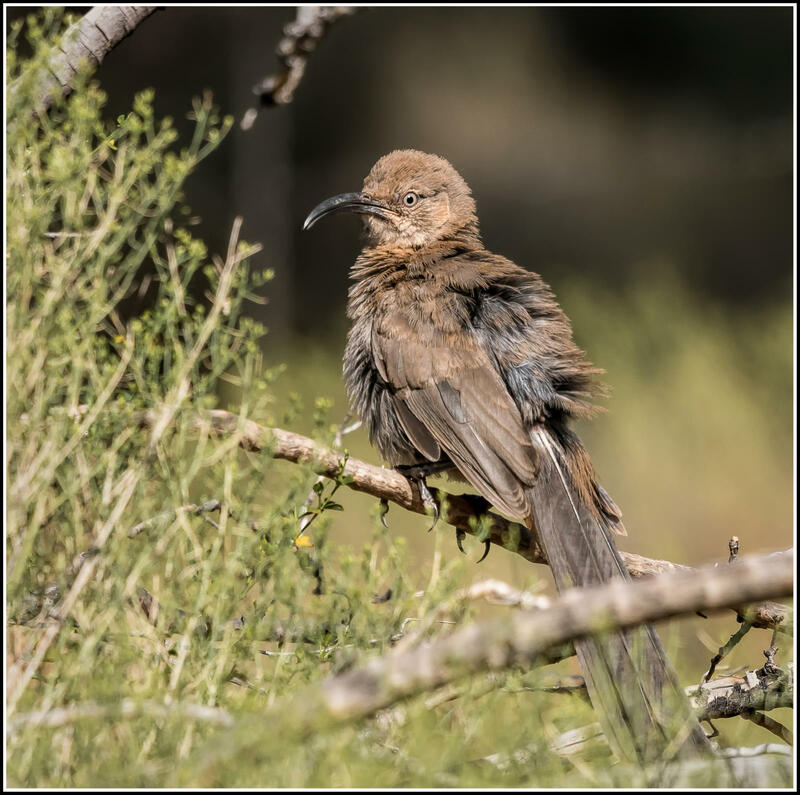 Second largest Thrasher in North America, second only to the California Thrasher. Diet: Mostly insects, some berries, centipeds. Sometimes eats small lizards. Berries and small fruits make up an important part of it's diet. Found throughout the Southwestern US and central Mexico. This one was found in Ivins, Utah. 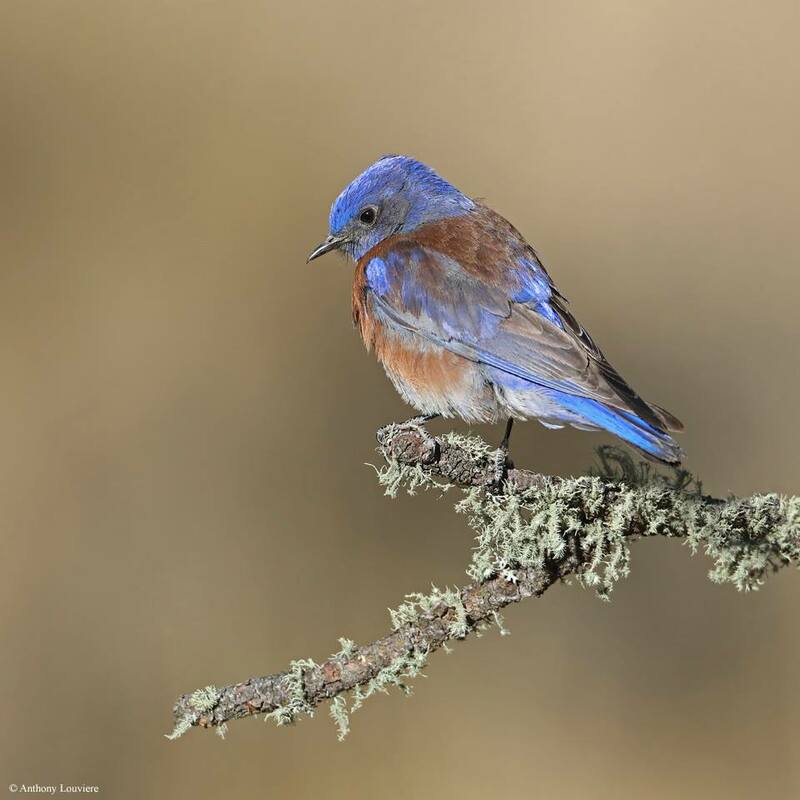 Western Bluebirds are among the birds that nest in cavities, or holes in trees, or nest boxes in partly open terrain of the west, from valley farms and orchards to clearings in mountain pine forest, this blubird is often common there. Summer: both sexes are gray with flashes of white in the wings and yellow on the face, sides and rump. Males are brighter and females are duller and may show some brown. Winter: birds are paler brown with bright yellow rump. Usually found in coniferous forests and deciduous forests. Photo taken in Lone Pine, Ca.